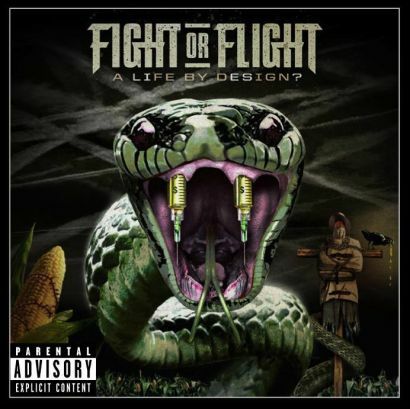 Fight or Flight is a band created by Disturbed guitarist, Dan Donegan, featuring Disturbed drummer, Mike Wengren. Lets get this out the way first this Album does not sound like a Disturbed album. The album is more hard rock in the vein of Non Point and Stone Sour. The lead Singer, Dan Chandler is from a band called Evans Blue and has a grunge tone to his voice which fits in with the music. A Life By Design? kicks off with the song "First of the Last" which is pretty good statement of intent with a mixture of hooks and some heavier vocals. There is a lot of good guitar work on this album including chugging and solos to keep the listener interested. Highlights include "Leaving" with its acoustic strum show casing Dan Chandler's singing before exploding with electric guitars whilst "A Void" mixes up the formula with electronics and guitar work which not be out of place on a Disturbed album. The album drives forward incorporating different rhythms to keep things moving. If a single was to be picked it would have to be "Shine” with it bouncy acoustic guitar, electric guitar fills and call & response chorus. The album finishes on "Tragedy" which fades in gently with its pulsing bass line and crunchy guitars before the catchy chorus hooks the listener in. The album does not feel over produced like some modern metal albums which is refreshing. The band have a good chemistry which is sometimes missing with side projects and makes this feel like a work of band who have been playing togettheir lot longer. This is a solid hard rock album that will stay glued in to many fans stereos, if you like Stone Sour, Nonpoint, Disturbed or even Device you will really like this.